“Ain’t Too Proud—The Life and Times of The Temptations” takes us on a whirlwind tour of music by The Temptations, The Supremes, and other Motown groups that we have loved for five decades. The Motown Sound is the soundtrack of my youth, growing up in the Midwest before MTV. Even in the racially charged 60s, no one could deny the beauty and artistry that exploded out of Motown. The music bridged a gap between the races. We anticipate meeting the singers in front of a big, brightly lit marquee emblazoned with the words “The Temptations.” When the five Temptations slide onstage on a magic moving walkway, they are singing the title song, “Ain’t Too Proud to Beg.” Their tight harmonies, flashy dress, and smooth dance moves draw us back to the 60s. Their unique sound transports us. We are treated to 34 songs from the Motown Catalogue via flashbacks by Otis Williams (dynamic Derrick Baskin). We see the story behind the music through Otis Williams’ eyes. Williams pulls no punches, letting us know that as a youth he spent time in jail for robbery. Although he was raised in a strict Texas household, when his family moves to Detroit, he falls prey to the tough streets. But in jail, he learns to love gospel music. When he is released, Williams joins gospel and Doo Wop groups on the Detroit sidewalks. 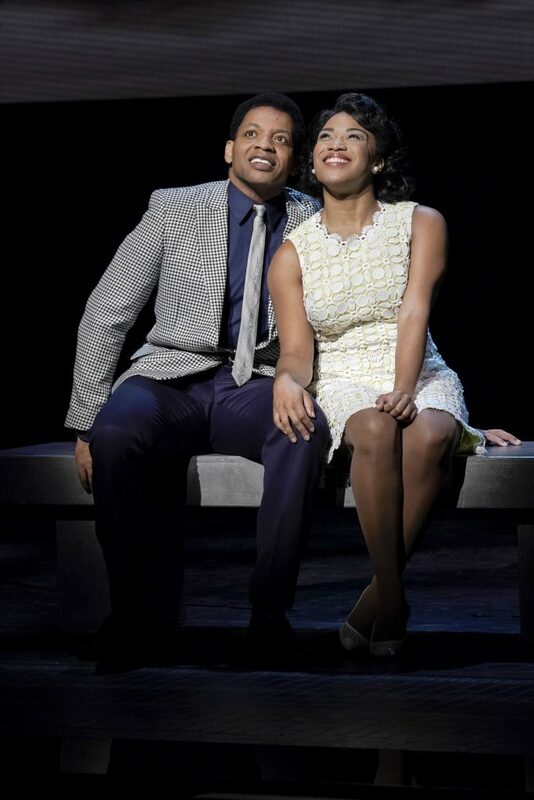 Legendary producer Berry Gordy (powerful Jahi Kearse), the founder of Motown Records, is impressed by the unique harmonies of Williams’ gospel singers. 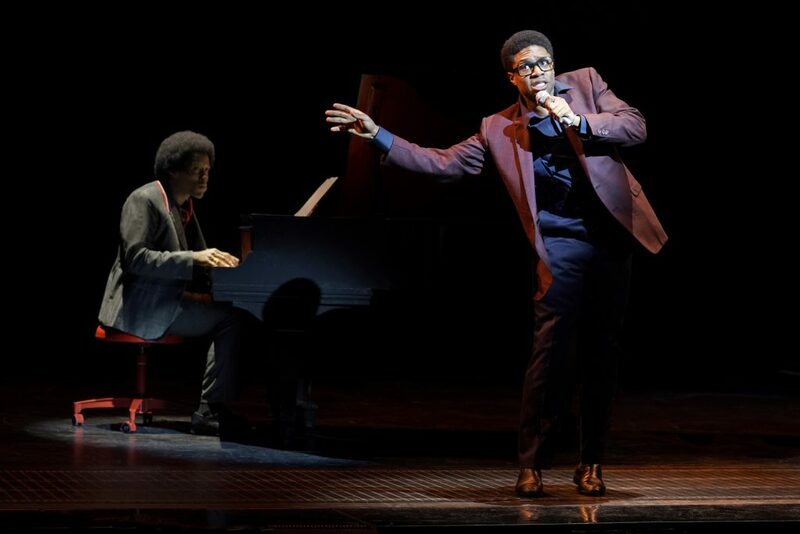 As David Ruffin, one of the original Tempations, high energy Ephraim Sykes wows us with his amazing splits and microphone acrobatics. But Ruffin gets into trouble and is forced out of the group, and his painful dismissal turns into a gripping story. 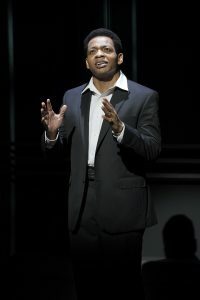 Ruffin’s departure traumatizes the group: his lead vocals formed the centerpiece of their original hits. Conflict about changing members breaks out among the singers. In a revealing remark, Otis Williams states, “A music group is like a marriage, you don’t always get what you want, but you negotiate for what you can live with.” Playwright Dominique Morisseau brings their rivalries and conflicts into the light. Otis Williams is the driving force behind the group and although he, and the others, proclaim several times that they are all equal, it is apparent that he is “more equal” than the rest of the group. 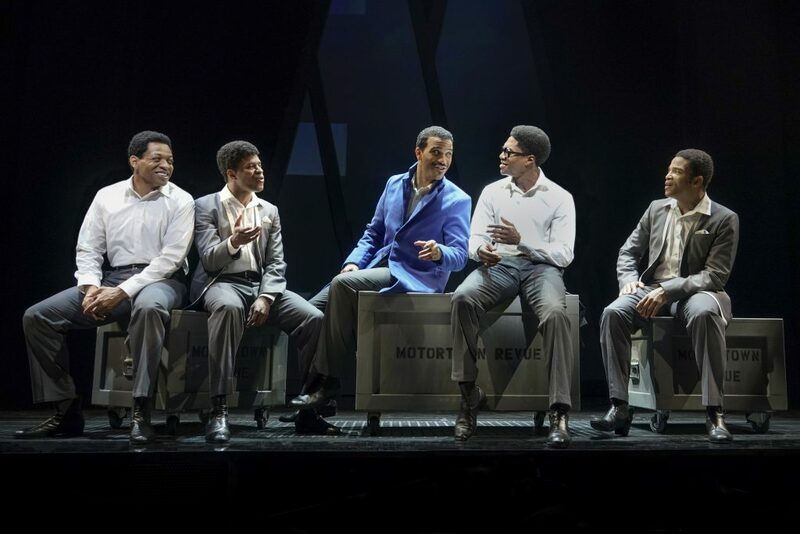 The other Temptations all suffer from personal demons: painfully shy Melvin Franklin (wonderfully gifted bass Jared Joseph), Eddie Kendricks (fine tenor Jeremy Pope), and ill-fated Paul Williams (poignant James Harkness). Their problems threaten to tear the group apart. When making decisions about the group, Barry Gordy and Otis Williams decide who must go and who can stay. In a sober reflective moment, Williams wonders whether it was worth losing all the brothers just to maintain the group. 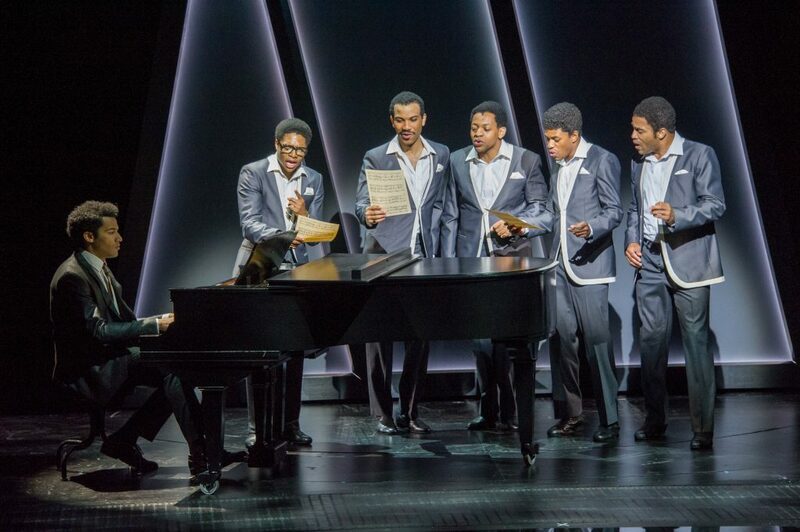 Under the experienced hand of two-time Tony award winner Des McAnuff, “Ain’t Too Proud—The Life and Times of the Temptations” is clearly destined for Broadway. The beautiful choreography of Sergio Trujillo really drives the performances and makes the music as exciting visually as it is acoustically. 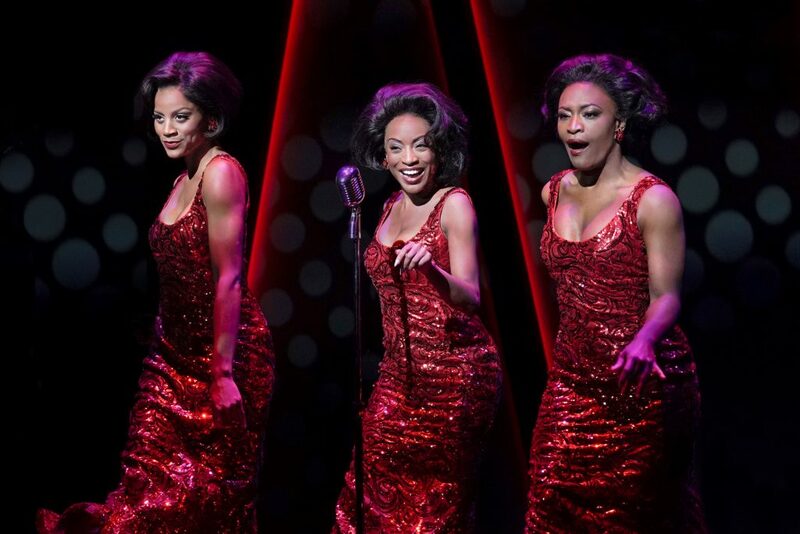 Costume designer Paul Tazewell parades a dizzying array of beautiful suits worn by the group. The large company features many fine performances and excellent musical accompaniment. Of particular note, Rashidra Scott reveals a powerful, soul wrenching voice as Josephine Williams, when she laments the loss of their son in a construction accident. She deserves more exposure. After seeing “Ain’t Too Proud,” we realize, again, why The Temptations are the best Rhythm and Blues group ever. Cast: Derrick Baskin, Jared Joseph, Jeremy Pope, James Harkness, Ephraim Sykes, Jarvis B. Manning Jr., Nasia Thomas, Taylor Symone Jackson, Jahi Kearse, Christian Thompson, Candice Marie Woods, Rashidra Scott, Jeremy Cohen, Caliaf St. Aubyn, E. Clayton Cornelious, Shawn Bowers, Esther Antoine, Rodney Earl Jackson Jr., and Devin L. Roberts. “The Legend of Pink”—Unapologetically Herself, at Theatre Rhino, S.F. “A Midsummer Night’s Dream”: A Tropical Paradise, at African-American Shakespeare, S.F.